Listen, I can’t fully explain to everyone how much joy I get out of watching stupid people crash and burn. When an imbecile gets caught out there in a flowerbed of nonsense, I’m absolutely positive an angel receives its wings. 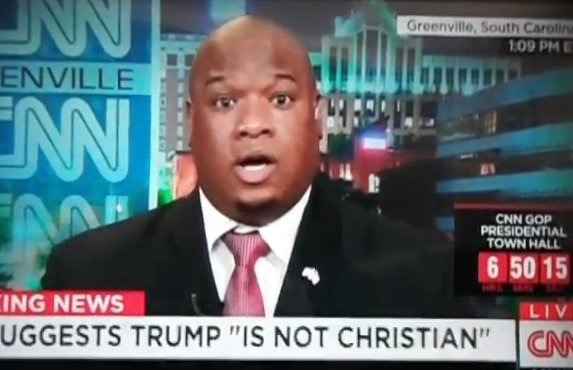 With that being said, I’d like to personally thank Pastor Mark Burns for reaching the final level of sideshow clown. Now that his fraudulent history has been exposed for the world to see, hopefully this means the public won’t have to see his cartoonish face any longer. Before I continue, if anyone out there is unfamiliar with Joanne The Scammer, do the world a favor and look her up. As always, Google is everybody’s best friend and will gladly display the hilarity that ensues when she’s on the screen. I mean, who doesn’t enjoy beating up an ex-lover’s new significant other and a good credit card scam? With that being said, thank you, Joanne, for showing us the ways of the Jedi when it comes to being messy and petty. Now that I’ve gotten that out of the way, it’s incredibly funny seeing Mark Burns embrace all of Joanne’s philosophies. Side note, with all of the tomfoolery he’s gotten himself into, I refuse to call Burns a pastor anymore. He doesn’t deserve that distinction, son. In any case, Burns’ claim to fame is making a fool of himself in support of Donald Trump. My first encounter with him came during the Republican National Convention. This dude took the stage and literally prayed for Jesus to defeat Hillary Clinton and the Democratic Party. Since then, he’s been on a media tour, doing interviews and sharing racist cartoons of Hillary. However; just when I thought I’d have to break my television in order to escape the madness, Burns completely imploded on CNN. During an interview with Victor Blackwell, all of Burns’ lies came to the forefront. By now, I already knew he got busted for lying about being a member of the Kappa Alpha Psi fraternity. Come to find out, that is the least of this man’s fairy tales. In addition to his other fibs, this guy lied about graduating from North Greenville University AND lied about serving six years in the Army Reserve. In actuality, he attended the aforementioned school for one semester and spent a brief amount of time in the National Guard. Look, this dummy can’t be serious, man! Did he not realize his colorful imagination would be exposed? That’s like me saying I have a hit record in Austria like that can’t be fact checked, man. I mean, if someone is going to fabricate their life, at least do it in a way that can’t be easily debunked, son. Now, Burns is looking like the idiot I always knew he was. In the end, I can’t even say I’m surprised, man. This is just another illustration of the comical campaign Trump has run. Trump’s presidential bid has been nothing but a bucket of Forrest Gump logic. Wait, just call him Forrest Trump, bruh! That’s how stupid this entire experience has been, son. I guess we can now use Mark Burns as another example of Trump’s profound ineptitude. Good day. This entry was posted in Politics and tagged Army Reserve, CNN, Democrat, Donald Trump, Forrest Gump, GOP, Hillary Clinton, Joanne The Scammer, Kappa Alpha Psi, Mark Burns, National Guard, North Greenville University, Republican, Republican National Convention, Victor Blackwell. Bookmark the permalink.